I have been orchestrating the Pathetique Sonata for months. I looked on IMSLP and saw no orchestral transcription. And I figured, if I am going to orchestrate a piano sonata, this would be the sonata to orchestrate because it sounds orchestral with all those chords and octaves, even as a piano solo. I am redoing my orchestration of the Pathetique Sonata though because I wasn't satisfied with it and also because I got very distracted from it. But unlike last time, I am finding difficulties orchestrating the melody. In the red boxes is the melody I am trying to orchestrate. It should be easy because it is chords. But the hard part of it is deciding on which octaves for which instruments. I mean if I have the oboe an octave up and the flute 2 octaves up, I will reach extremes of range and probably need the piccolo. On the other hand, the flute is quiet in its low register and would be drowned out by just the other woodwinds, not to mention the strings and brass. Here is what I have so far of the woodwinds. 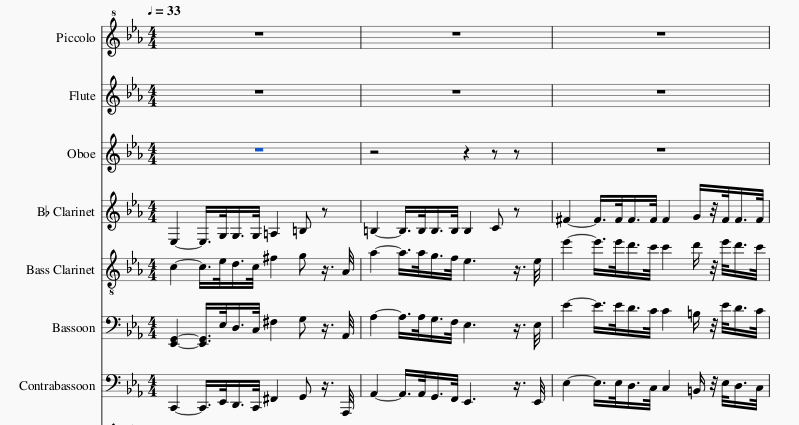 As you can see, I have it in concert pitch on Musescore to make writing the clarinet and horn parts easier. And as you can see, the clarinet is currently taking the lowest melody line starting in its lowest octave. So what should I do? Should I copy the melody not only by pitch but also by octave(which would mean writing the entire melody 8va)? Should I go my normal 1 octave between instruments? Should I have the flute be within an octave of the oboe and have the top notes played by the piccolo an octave above the flute? My general inclination is to treat the orchestra (especially the winds) as a collection of solo instruments, not as a single big instrument. Take that as a warning as you consider my advice. I might have close to the full orchestra on the forte chords, but on the piano sections, I would go for just 2 pairs of woodwinds. If I want the same pairs of woodwinds throughout, probably 2 bassoons and 2 clarinets with a solo clarinet for the second half of measure 4. If I want to vary the woodwinds (in the spirit of Webern's orchestration of Bach), I would try bassoons and clarinets, followed by bassoons and oboes, followed by clarinets and flutes, followed by all flutes/oboes/clarinets for the first half of measure 4, followed by an oboe solo for the second half of measure 4. If you look at most orchestra scores, you'll see the wind instruments have lots and lots of rests. You don't need them all playing all the time. Not the answer you're looking for? Browse other questions tagged piano orchestration beethoven sonata or ask your own question. 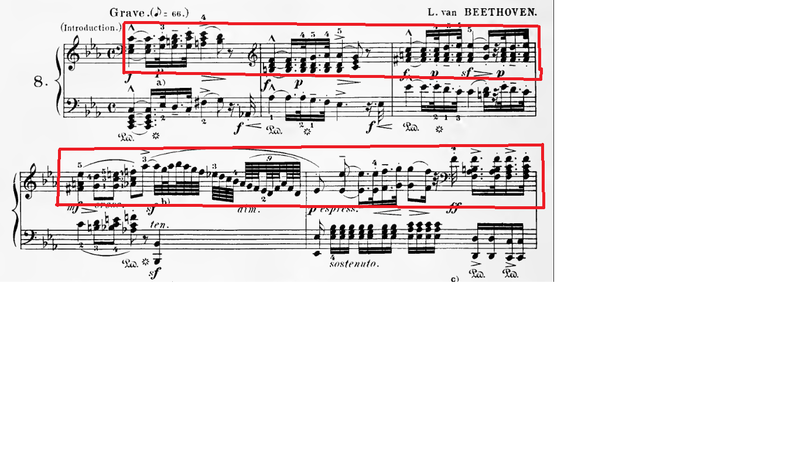 Should I connect top melody of Moonlight Sonata 1st mvmt using my fingers? What combinations of wind instruments could mimic or closely resemble the timbre of a pipe organ? Advice on arranging piano music for wind quartet?